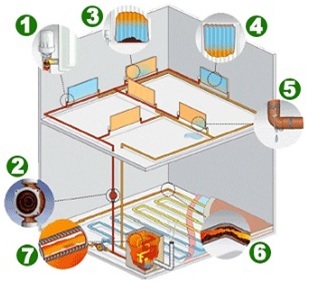 The diagram below shows a typical heating system and problem areas. With modern boilers particularly now with the advent of high efficiency boilers there is a need to ensure your system is clean before installation and treated with inhibiter when commissioning. There is an approved standard required by all manufacturers known as BENCHMARK to which installation must be carried out to ensure your manufacturers guarantee is valid. All new systems should be pre-commission cleansed in accordance with BS: 7593 and Benchmark. This ensures flux residues, excess jointing compounds, mineral oil and other contaminants that can be found in the system following installation, and that can affect the performance of the system or cause component failure, are removed. It is important when installing new boilers into old systems that all sludge is first removed from the system or this could accumulate in the new boiler and lead to premature failure. Additionally, in hard water areas existing systems will have accumulated limescale together with corrosion deposits in the heat exchanger, which could easily have reduced the boiler efficiency by over 5%. Pump seizure and failure The abrasive and magnetic properties of black oxide sludge increase shaft and bearing wear in pumps causing them to stick or fail. Cold spots The familiar cool low central area of a radiator indicates a build-up of black sludge sediment that restricts flow and reduces heat. Scale (lime scale/iron oxides) in boiler leading to reduced efficiency, increased emissions, higher fuel bills and boiler noise. Still Confused? Don’t Panic We’re Here For You And Any Questions You May Have We Will Help To Answer Them! When used in conjunction with a Fernox cleanser a typical power flush can be completed in 3-4 hours. MagnaClean® Power Flushing Filter has been developed specifically for professionals to undertake the best possible system cleaning and maintenance. MagnaClean Power Flushing Filter is compatible with all power-flush machines. It has taken the heating and plumbing sector many years to recognise the benefits and full potential that power-flushing can bring to ageing, sludge-ridden, heating systems. The procedure is extremely effective. Extensive testing has demonstrated that power-flushing is best industry practice when it comes to maintaining old systems. 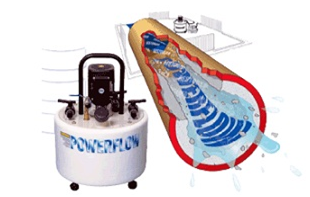 Power-flushing has the ability to restore circulation and improve system efficiency. When using MagnaClean Power Flushing Filter the benefits for installers are immediate.